Sorry, city leaders. I just didn't know there was a vibrant Skyway automated monorail in town. I kind of thought it was either an idea that had never been made or something that was closed down. Although I still have not seen this in person, I went to several websites to confirm that it does exist. My goal, in the next year-and-a-half, is to find a reason to ride this free people-mover. The JTA Skyway serves points of interest on both the Northbank and Southbank. 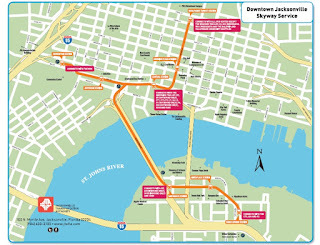 The automated Skyway provides riders with easy access to their workplace, hotels, restaurants and entertainment venues. That sounds pretty good. Except I don't work or live in the areas served. And since I do live close, I'm not going to get a hotel. That means that for me, it's about the restaurants and entertainment venues. Let's start at the Kings Avenue Station (one of eight) and see which restaurants and entertainment venues are listed, assuming I might park my car somewhere and then catch the Skyway. After using the bus to get to a Jags game, it's about 1.5 miles to TIAA and maybe a mile to the baseball stadium, but these aren't on the map. I assume there are lots of restaurants, but they are also not listed. Based on the entertainment venues listed, we can imagine the interests of the typical Skyway rider. The Art Walk thing is in Hemming Park. People can feel like they are in an urban center while riding mass transit to an artsy festival. Really, there's not a lot listed that would make anyone bother. The Landing is a bust, and you would rather park at the hospital than ride a tram. The Convention Center is probably the best use, especially since the system is near lots of hotels. Interline and Maxwell House are not really retail stores, from what I can tell. This is the most important use of the system, I'd assume. The monthly art festival along with the other listed museums, schools, performing centers, and the library. Again, it would make you feel like you're living in a city that values these elements as you travel around for free, hoping your car doesn't get a window smashed wherever you parked it. I assume there aren't a whole lot of people who use this system for law-related trips, but you could. I assume, like most big cities, there are people who live out near me who think the Skyway is a waste of money. I'd like to think it's not, but it's also not the easiest system to bother using unless you're interested in the places on this list. It probably gives visitors to the city an impression of a place where there's abundant, free transportation, but that's not really the whole story. The primary reasons are the decline of the downtown workforce and lack of connections to other neighborhoods and modes of transit. The system became a major point of contention in Jacksonville, with critics considering it a "ride to nowhere" and a waste of resources. So that leads to new vehicles for the same system. Some people want to convert it to a walking / bike path. One thing I know for sure is that I better go take a free ride on it before it disappears. It will be like riding a miniature version of the Disney Monorail without the excitement of spending my money on overpriced food and waiting in long lines.